A few weeks ago when we visited the Underwater World Singapore the kids were really fascinated by the jellyfishes which they saw at one of the exhibits. 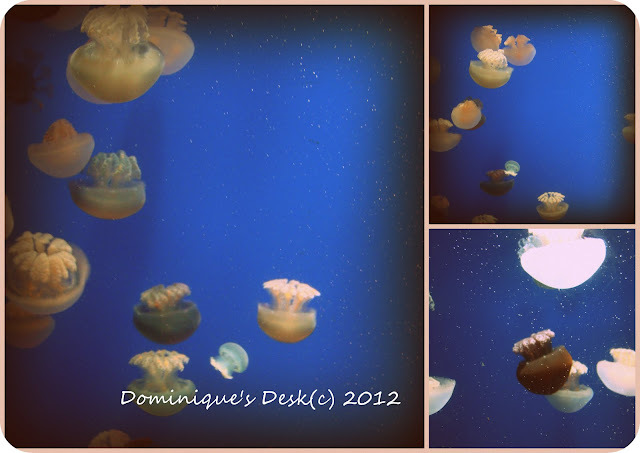 The jellyfish swimming in the tank really looked like bubbles ballooning and ebbing as they moved about. They looked like inverted mushrooms when they moved around randomly in the tank. Translucent jellyfishes of different shapes swimming in the tank. They looked so delicate moving through the water. They look so harmless but these carnivorous creatures can really leave a nasty sting if we come across them in the sea. Have you seen jellyfishes before? Jelly fish are SO beautiful to look at – at the AQUARIUM! They are rather terrifying to see in the ocean – when you are in it – considering their sting! I’m always amazed at how something so beautiful can be painful to touch. Love them jellyfish, never fail to fascinate me. They have a calming effect which will soon lead me to my dreamland soon if i keep staring at them. beautiful shots! like they are glowing in the dark.. Very neat shots! We spent all day at the zoo today and the jellyfish are always so much fun to watch! Love it! Those are great jellyfish pictures! I haven’t seen a jellyfish, even up close. I was honestly scared about it especially whenever we are in the beach. I would be mesmorized too, what a beautiful thing to see! Very neat picture. I love watching fish…this would be very peaceful. I don’t think I’ve seen Jelly Fish up close, not even in an aquarium! They do look quite fascinating but I’m sure one wouldn’t want to get too close. I think jellyfish are beautiful, but I have made sure never to touch it.